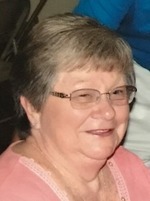 Cindy Susan Smith, age 71, of Carl Junction, Mo. passed away at 6:05 a.m. Tuesday, January 2, 2018 at Freeman Hospital West in Joplin. Cindy was born January 16, 1946 in Joplin, Mo. and was a lifetime area resident. She had previously worked for the Top Value Stamp Store in Joplin, and later worked in the Catalog Dept. at Sears. Cindy served as an Officer with the Joplin Woman’s Bowling Assoc. in Joplin. She enjoyed going to their lake property on Grand Lake to fish, and watch the pelicans. Cindy married Gary A. Smith September 7, 1968 in Joplin and this year would have celebrated 50 years of marriage. Additional survivors include a daughter, Kim Massey and husband Brian, Carl Junction, one son, Geoff Smith and wife Angie, Webb City, Mo. one brother, Bob Brasch and wife Linda, Joplin, , six grandchildren, Dustin Massey, Colton Massey, Jordan Smith, Jeremy Smith, Brooke Randall, and Hannah Randall, one great grandson, Remington Massey, and her beloved dog, Sophie. Services will be at 2:00 p.m. Friday at the Mason-Woodard Chapel with Pastor Russell Rodderick officiating. Burial will follow in the Ozark Memorial Park Cemetery. Visitation will be from 6-7 p.m. Thursday at the Mortuary. The family requests memorial contributions be given to the Joplin Humane Society in care of the Mortuary. Arrangements have been entrusted to the Mason-Woodard Mortuary of Joplin, Mo.